DOCTOR WHO - Nods To The Past: Series One | Warped Factor - Words in the Key of Geek. In the start of a new series Dan Luisi looks at the many references to classic Who which are scattered throughout the new series. To start with we go back ten years to Series One, Christopher Eccleston's sole season as the Type 40 key-holder. Have you caught every reference to classic Who throughout the new series? Many of them are glaringly obvious, but some are a little more subtle. Thought Russell T Davies or Steven Moffat had come up with a new clever plot/phrase/enemy/gadget for the Doctor? It's just possible that it's one we may have seen briefly before, 30 or more years earlier. So let's take a look at all the nods to the past that you may or may not have noticed, and I'll also offer some good 'jumping in points' for fans of new-Who that are yet to experience the earlier years. Christopher Eccleston's debut adventure Rose features the Autons and the Nestene Consciousness, both of which first appeared in another Doctor's debut adventure, Jon Pertwee and Spearhead From Space. This is a great starting point for anyone to experience classic Who, you will see a direct nod to this adventure when the shop mannequins come to life. The very first Third Doctor adventure is a cracking yarn, and the start of his forced exile on Earth. Working your way through the Third's era you'll meet the Autons again in the following season's Terror Of The Autons. You'll also meet the Master, played by Roger Delgado, for the very first time. The idea that the TARDIS's telepathic field is what gives Rose the ability to understand, and be understood by, aliens was first explained by Tom Baker's Doctor in The Masque Of Mandragora. And as for that phone that allows Rose to call home from anywhere in the universe, well we've seen something very similar before. First time round, during The Three Doctors, the Second Doctor modifies the Brigadier's radio telephone to create a supercharged communications device. Here's a little continuity error for you, or is it just 'the Doctor lies'? The Doctor tells Rose he is 900 years old, but during his Seventh phase he claims he is 953 (Time And The Rani). Aliens of London is the first time we hear of U.N.I.T. during the new series. The United Nations Intelligence Taskforce (now rebranded to the Unified Intelligence Taskforce) was first seen during the Second Doctor's era and remained an important part of the series throughout the next 20 years. Think the idea of a Dalek 'flying' was something new? Think again. Sylvester McCoy's Seventh Doctor encountered one that hovered during Remembrance Of The Daleks. 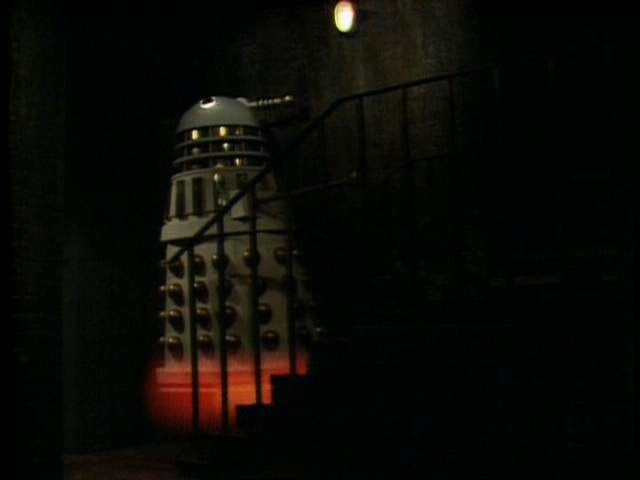 At the time it was supposed to dispel the myth that Dalek's couldn't climb stairs, but go back even further and during the First Doctor adventure, The Chase, a Dalek was implied to have taken flight. I expect budget constraints didn't allow for that to happen on screen in 1965. Sticking with The Chase, it's possible that Russell T Davies wanted to credit that story for the flying Dalek because when the TARDIS first materialises there is a dead Mechanoid from that adventure just about visible in the Vault. Dalek also features lots of other classic series villains, including the decayed head of a Sea Devil (from the Third Doctor adventure The Sea Devils), plus an incorrectly labelled Cyberman head. Claiming it's from the 1968 story The Invasion, but it's a later Cyberman design. I think it's most likely taken from the 1975 Fourth Doctor adventure, Revenge Of The Cybermen. We first meet the Captain Jack Harkness during this episode, he's described as a former Time Agent from the 51st century. Another nod to the past, because almost 30 years earlier during The Talons of Weng-Chiang, the character Magnus Greel is described as a time traveler from the 51st century who fears pursuit from Time Agents. The 51st Century is one of those dates that is often mentioned in both classic and new-Who. In classic Who it is the home era for K-9 and the setting for the Fourth Doctor adventure The Invisible Enemy. The Empty Child is also the first time in the new series that the Doctor says his name is 'John Smith'. This was his regular alias during the classic series, first appearing during the Second Doctor adventure The Wheel in Space, and most predominantly whilst in Earth bound exile during his time as the Third. The Ninth Doctor also kind of gives a reference to his Granddaughter Susan when Dr Constantine states that before the war he was a father and a grandfather, and now he is neither, but is still a doctor. Eccleston's Doctor reply's "I know the feeling". The Slitheen, Margaret Blaine, says that as a child she was threatened with being fed to venom grubs. 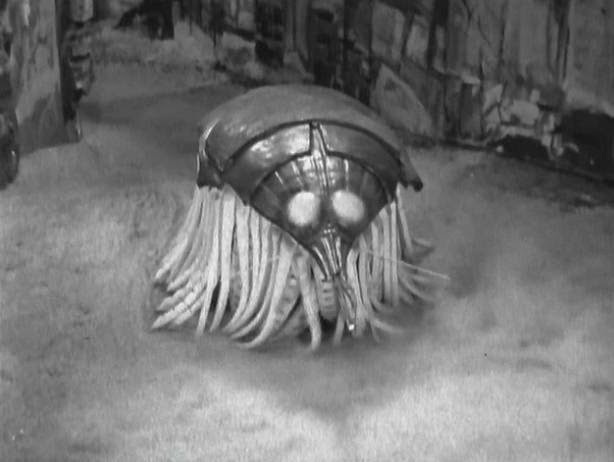 These creatures first appeared way back in the 1965 First Doctor story The Web Planet. There's another nod to The Web Planet during this penultimate episode of series 1. During The Weakest Link segment a question about the Face Of Boe states he is the oldest inhabitant of the Isop Galaxy, which is also where planet Vortis is - the setting for The Web Planet. Later in Bad Wolf, Jack and the Doctor are sentenced to the Lunar Penal Colony, which is also where the Third Doctor was sent to in 1973's Frontier in Space. Here's a great pub quiz factoid for you. A common term used in the show, the word "transmat" was first heard in Doctor Who as shorthand for matter transmission in the 1975 Fourth Doctor adventure The Ark in Space. Prior to that, in The Seeds Of Death they called it a T-Mat, and even earlier in The Daleks Master Plan they called it Particle Dissemination. 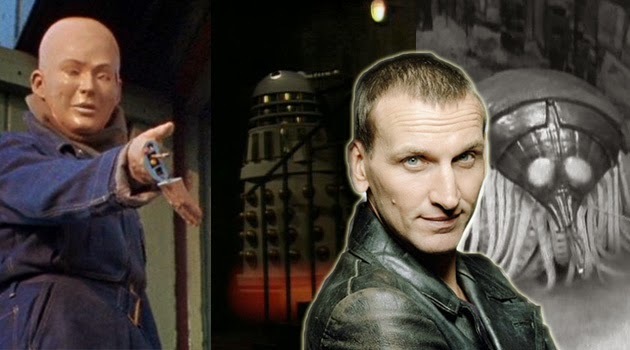 Christopher Eccleston's final episode had several elements that we'd first encountered in past adventures. To start with the Bastic bullets, that are capable of penetrating Dalek casings, were first mentioned in the 1985 Sixth Doctor Dalek encounter, Revelation of the Daleks. They return in The Parting of the Ways when Captain Jack tells his defenders that their ammunition consist of bastic bullets. Then there's the concept that the TARDIS console directly harnesses the energies which drive the ship (the heart of the TARDIS) and is at least in some sense alive and self-aware. That dates back to the 12th ever episode of the show, 1964's The Edge of Destruction. Before this episode the last time we saw a Dalek Emperor was way back in 1967, during the Second Doctor story The Evil Of The Daleks. After that every Dalek leader was either Dalek Supreme or their creator Davros. In a possible nod to 'the Creator', the Emperor Dalek's final words in The Parting of the Ways are "I cannot die! ", the same words said by Davros in the Fifth Doctor's 1984 adventure Resurrection of the Daleks. However, not all established elements from the classic series were carried over. It had been long established that the TARDIS is protected by a force field generator, and in the 1969 adventure The Krotons we saw that it had a Hostile Action Displacement System (HADS) allowing it to teleport away when under attack, but in The Parting of the Ways Rose claims that the TARDIS has no defences. I suppose these things could've become damaged in the Time War. That's all for Series One, but please let me know if you think I've missed anything. Next time I'll look back at David Tennant's first year as the Doctor, Series Two.